Strawberries were prized in ancient times by the Romans for its medicinal uses. 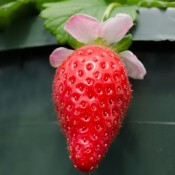 Today, the common garden strawberry is a hybrid of two species: the big and juicy Chilean strawberry crossed with a sweet red American species. Strawberries are actually a member of the rose family are not “technically” berries. They are the only fruit with seeds on the outside. An average strawberry has about 200 seeds. Strawberries are one of the most common garden crops in North America because they are easy to grow and produce berries for many years. Strawberries are best planted early spring or late fall and they need a lot of sun. They taste best when grown in humus-rich soil. Soil should be well drained, as the plants hate having wet feet which can lead to root rot. 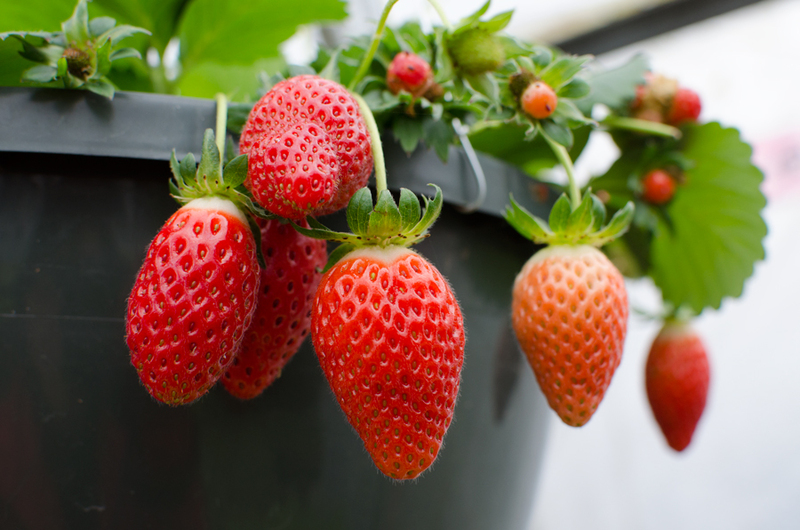 Plants such as eggplant, tomato, peppers, and potatoes should not be planted next to strawberries because they carry verticillium that can cause the strawberry plant to rot. June bearing: produces one large crop per year, during a 2-3 week period in spring. The fruits of June bearing tend to be the largest of three types. Everbearing: produces 2 or 3 intermittent crops during spring, summer, and fall. The fruits are bit smaller than June bearing. Day Neutral: similar to everbearing, but produces continuously throughout the growing season. Strawberries contain more Vitamin C than some citrus fruit. They are a fair source of folate, fiber, manganese, potassium and iron. Strawberries are packed with antioxidants that help keep “bad” (LDL) cholesterol from oxidizing and reduce the chances of heart disease, high blood pressure and certain cancers. Fruit usually sets 3 to 5 weeks after blossoms first appear. Some experts say you are supposed to cut off the flowers in the first year to ensure a larger crop the second. Harvest berries when they are fully red and ripe; that’s when the flavour is most intense. They will not continue to ripen once they are picked. Strawberries do not store well so pick every couple of days. Removing the hulls when picking greatly increases spoilage. Keep refrigerated in a ventilated basket or container.